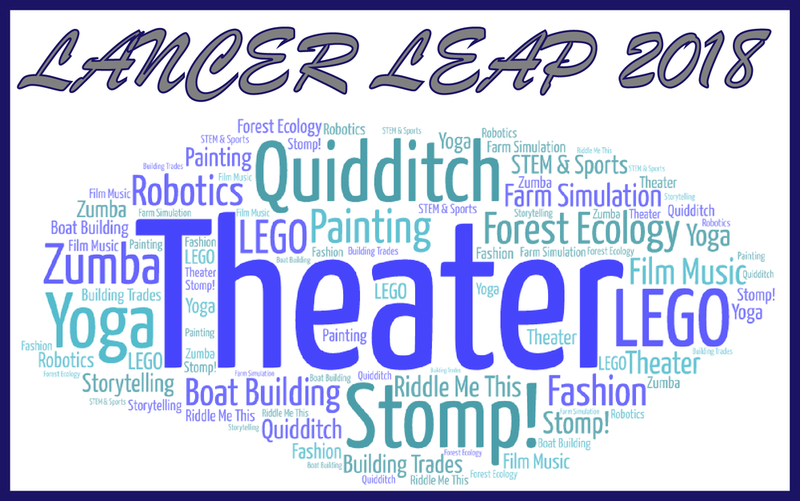 This coming spring will mark the eighth annual Lancer Leap spring project term at Ellsworth Community School. During Lancer Leap students are enrolled in three high interest project-based classes each day during the last four weeks of the school year. This morning ECS unveiled the 2018 slate of Lancer Leap electives to middle and high school students. This year’s classes include Theater, Boat Building, Construction, Forest Ecology, LEGO Sculpture, Farm Simulation, Introduction to Film Music, Quidditch, LEGO Robotics, Zumba, Riddle Me This, Yoga Journal, Painting, STEM & Sports, and more. By keeping the elective offerings fresh each year, ECS is able to generate renewed excitement as students and teachers look forward to participating in unique and innovative learning opportunities that keep them engaged in school in May and June. ECS concludes the school year with the Lancer Leap Showcase where students demonstrate and perform skills learned during Lancer Leap. This year’s showcase is scheduled for Thursday, June 7 at 5:00 p.m. in the high school gym. The Lancer Leap 2018 Course Guide, which provides the complete 2018 schedule as well as description for each course, is now available online; http://5il.co/34bo.